Annabeth Gish knows spooky. While she may have gotten her big break in the romantic comedy "Mystic Pizza," and has co-starred in "Wyatt Earp," "Double Jeopardy," "West Wing," "FlashForward" and "Pretty Little Liars," she also starred in the eighth and ninth seasons of "The X-Files" as Monica Reyes. So, yeah, Annabeth is familiar with strange and unexplained phenomena. This Sunday and Monday night at 9/8c on A&E, Annabeth is exploring the unknown again, this time starring in the television miniseries adaption of Stephen King's bestseller "Bag of Bones." This four-hour, two-day event stars Pierce Brosnan as bestselling novelist Mike Noonan, who is unable to stop grieving after the sudden death of his wife Jo (Annabeth). Suffering from writer’s block, a dream inspires him to return to the couple's lakeside retreat in western Maine. While there, Mike befriends an attractive young widow, Mattie (Melissa George) and her daughter Kyra (Caitlin Carmichael), and becomes involved in a custody battle with the child's enormously wealthy grandfather. Though his ability to write suddenly returns, Mike is plagued by ever-escalating nightmares and mysterious ghostly visitations from Sara Tidwell (Anika Rose), a blues singer whose spirit lingers in the house. As he is haunted by the many secrets at the lake, Mike comes to realize that his late wife still has something to tell him. Celebrity Extra: I just watched the press screener, and I have to tell you, "Bag of Bones" scared the bejeezus out of me! 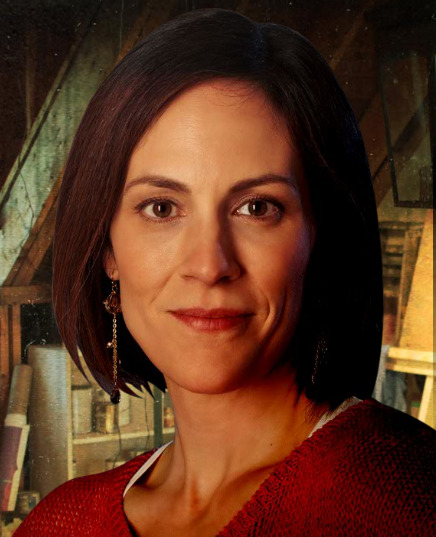 Annabeth Gish: That's great! It’s that good kind of spooky, isn't it? This is why Stephen King is so prolific and popular, because he gets at the root of horror where it’s not just horror for horror’s sake. It’s horror with heart. His work has real grit and feeling behind it, and particularly "Bag of Bones." That’s why it’s so scary, because there’s so much feeling invested. My husband has said that he was a bit wary of watching it. He’s a stunt man, but he’s wary of watching horror films. He might be running in and out of the next room (as I watch it Sunday night). CE: Had you read the book beforehand, or did you want to go into the movie without any preconceptions, since often things have to change from novel to screenplay? AG: I had not read it and (director) Mick (Garris) said, “Don’t read it until afterward.” So when I finished my work on the movie, I met that tome of a novel. CE: Did you get to meet Stephen King? Was he on the set at all during filming? AG: No, and you know, I feel like he’s one of those people who — and I don’t have many — that I want to meet so badly that I almost don’t want to meet them. Do you know that paradox where you love their work so much and you respect them that it kind of exists in this other realm? I still would love to meet him, of course, but I also I kind of feel like I’m psychically linked to him because I’ve now worked in two of his projects (the other being "Desperation"), brought two of his characters to life. It’s been a pleasure to get involved in his universe. CE: So you've got one degree of separation with Mr. King, his actual books! AG: Right, exactly! And the best part was when we were shooting some of the promo stuff for "Bag of Bones," the fabulous Dark Score Stories website — oh my God, it’s a treat because it’s just so finely done. Part of the idea behind it was to lace a bunch of Stephen King clues from the entirety of his writings on this website. I got to do this photo shoot, and it’s just me and some crows, which I have a proclivity toward crows. I just respect them so much. CE: Besides the fact that the material is just exceptional, what were some other reasons behind your wanting to take on the role of Jo Noonan? AG: There are so many elements. The fact that Mick Garris was directing it — who I have worked with before and who I think is wonderful — he brings Stephen King’s books to the screen so well and so masterfully. He himself is a master of horror. So having known Mick and the chance to work with him again, that was an instant yes for me. And Pierce Brosnan of course. The opportunity to work with Pierce, and also just the script. I felt like, especially with Jo — comprehensively it wasn’t that I just fell in love with Jo Noonan — I fell in love with the entire cast of characters. Sarah Tidwell and her mystery, and Mike Noonan and Mattie and Kyra — the script as a whole was one of the best things I’ve read in a long time. To be honest, one of the highlights of this experience for me was working with Pierce, because he invested so much in this material that he raised it to an operatic level. He doesn’t play small, and he brought something new to every take. It was very inspiring. He might just be one of the most impeccable men I’ve ever worked with. CE: He seems like he is such a gentleman as well. AG: Yeah, a complete gentleman and yet this driven, hungry artist. It was definitely a highlight to work with and get to know him on a personal level. CE: Have you been able to watch your character's death scene yet? AG: What is so weird is that I couldn’t watch it. I don’t know what it is, I just, I’m afraid to watch that part. I think for Pierce that scene was really profound as well, because you’re dealing with death and loss and reliving all that, that scene was really emotional to shoot. AG: To be honest, those are the scenes that I watched. I don’t really like watching myself, so I kind of fast-forward through my stuff and watch everybody else’s scenes. But his scenes I definitely watched. CE: Are you going to be watching on Sunday night with the rest of America? AG: Yes, I will be. But I am also truly so very excited for people to watch this because I think they're going to be powerfully affected. It’s not just a horror movie; it’s not just a mystery. It’s like a horror show, a mystery and a deep love story, and that’s why I think it’s going to appeal to a lot of people. CE: Another one of your roles that I really enjoyed watching was when you played Monica Reyes on "The X-Files," one of my all-time favorite television shows. What was that working experience like? AG: It was superlative. I had such a great time on that show. I adore Robert Patrick, and Gillian (Anderson, Dana Scully), David (Duchovny, Fox Mulder), Chris (Carter) and Frank (Spotnitz), and the entire machinery that was "X-Files" was divine. I really look back with deep fondness on the entire experience, and with a bit of sadness too. Although we couldn’t ever reach the level of Mulder and Scully — they were legendary, so we couldn’t quite ascertain that level. But I do miss Doggett and Reyes. I miss their storyline that I feel sort of had to abruptly end. But my gosh, I have nothing but deep fondness for that experience for two years. And I met my husband on that show, so I have wonderful, wonderful gratitude for that time. And for all the fans — no one was cruel toward me. I think there was just this loyalty to Mulder and Scully, which you could understand. CE: What can you tell me about "Pretty Little Liars"? Will we be seeing Dr. Sullivan when the second part of the second season premieres on Jan. 2 on ABC Family? AG: I don’t know if I’m at liberty to say ... You will see Dr. Sullivan again. In what way shape or form, I cannot say.